“Asparagus and morels come into season at the same time and together, they fairly shout spring,” says Greg Atkinson of Organic To Go. They are two elements in this carefully orchestrated yet fun-to-prepare dish. Still, by switching out seasonal vegetables, you can easily adapt this meal for any season of the year. If you don't have access to morels, shiitake mushrooms are a good substitute. Our thanks to Greg Atkinson and Chefs Collaborative for permission to publish this recipe. In a large saute pan over medium-high heat, melt the butter. Sprinkle the breasts of chicken with salt, pepper and nutmeg and lay them gently into the sizzling butter, to avoid getting splattered with the hot butter. Allow the breasts to cook on one side until they are well-browned underneath, about 5 minutes, then turn the breasts over and pour in the chicken broth. Reduce the heat to medium and cook the breasts of chicken uncovered in the chicken broth until the broth has reduced to about 1/2 cup and the meat is cooked through, about 25 minutes. (An instant-read thermometer will register 170 degrees when it's inserted into the thickest part of the meat.) 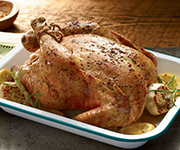 If the chicken is done before broth is fully reduced, remove breasts, keep them warm and return them to the broth when it is reduced. While the chicken is simmering, prepare the asparagus and morels: If using dried morel mushrooms, put them in a heat-proof measuring cup or a small mixing bowl and pour on just enough boiling water to cover; press the mushrooms down with the back of a slotted spoon to help them absorb the liquid. Let them stand in the water to soften for at least 5 minutes. Lift the soaked morels out of the soaking liquid, allowing any particles to sink to the bottom of the container then carefully pour most of the soaking liquid in with the simmering chicken, leaving behind any debris left in the soaking container. Slice the soaked morels into rounds (or leave them whole). If you are using fresh morels, slice them into rounds and keep them near the stove. 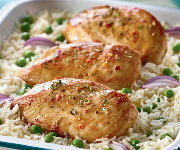 When the chicken is fully cooked, transfer it from the pan to four serving plates, using tongs or a slotted spatula, and leaving the cooking juices in the pan. Add the soaked or fresh morel mushrooms to the chicken cooking liquid and cook the mushrooms in the liquid until they are tender and heated through, about 5 minutes. Meanwhile, drop the asparagus and the carrots into the boiling water with the salt and cook, just until the asparagus is bright green and the carrots are barely tender, about 4 minutes. Drain the vegetables and distribute them evenly between the four serving plates, tucking the vegetables around the breasts of chicken. Drizzle olive oil over the vegetables and sprinkle them with the chopped parsley and the freshly ground black pepper. Stir the sour cream in with the mushrooms and cook just until the cream is piping hot, about 30 seconds. 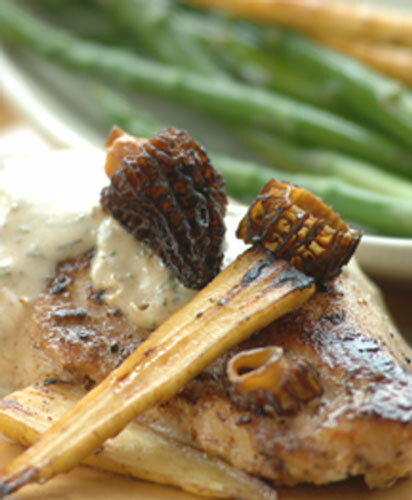 Distribute the mushroom and sour cream sauce over the chicken breasts and serve at once.